In an admission that should surprise nobody who’s given it more than a minute of actual thought, Jeremy Clarkson revealed he asked Top Gear’s “backroom boys to play around with the differential” to make the little three-wheeler topple every time he yanked the steering wheel. This really shouldn’t be shocking news, because if you took Clarkson and Top Gear as truth, you’d probably be wondering why the whole middle of the British Isles isn’t running red and black with blood and oil from all of the thousands of Reliant Robins that have been rolling around, killing drivers and pedestrians in an avalanche of boxy little three-wheelers. TO JUDGE from the letters I get and the remarks in the street, it seems the most memorable thing I did on Top Gear was a short segment about the Reliant Robin. You may remember: I drove it around Sheffield and it kept falling over. Well, now’s the time to come clean. A normal Reliant Robin will not roll unless a drunken rugby team is on hand. Or it’s windy. But in a headlong drive to amuse and entertain, I’d asked the backroom boys to play around with the differential so that the poor little thing rolled over every time I turned the steering wheel. Naturally, the health and safety department was very worried about this and insisted that the car be fitted with a small hammer that I could use, in case I was trapped after the roll, to break what was left of the glass. Reliant sold plenty of cheap, usable little three-wheelers, and somehow managed to never be charged for crimes against humanity. The cars weren’t the most stable things in the world (no pointy-fronted three-wheeler is) but they certainly didn’t tumble around like a roofie’d Mary Lou Retton at every turn. Hopefully this means we’ll get to see some Robins portrayed in a more positive light in the ex-TGer’s new Amazon show. 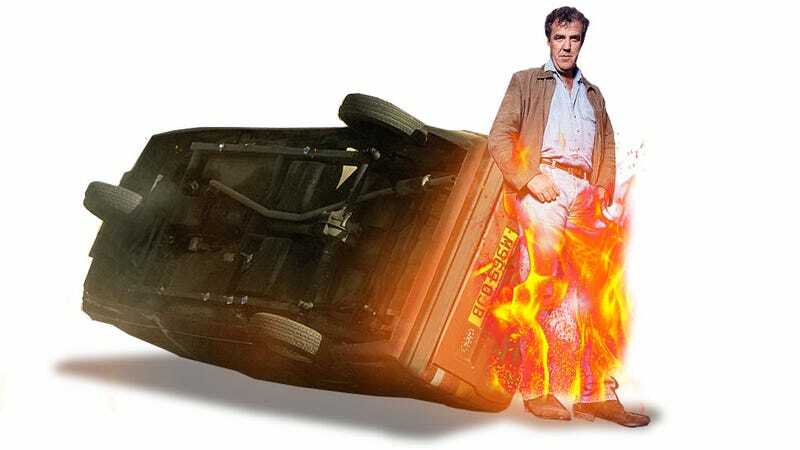 As Jalopnik’s only Reliant owner, I’m pleased that Clarkson finally came clean about this. But I can’t really blame them too much for doing it — it did make for a hell of a show.